In Istanbul, major public transit projects are back under way after years of paralysis. The problem wasn't a lack of financing, but the layer upon layer of ancient artifacts that turned up every time the earthmovers started their work. The excavation began eight years ago on projects intended to ease Istanbul's notoriously clogged traffic. The job included building a tunnel under the Bosphorus Strait and linking it to a rail and subway network. When the dig was stopped several years ago, eyes rolled and shoulders shrugged. Istanbul is, after all, one of those grand and ancient places — like Rome, Athens or Jerusalem — where this kind of thing tends to happen often. 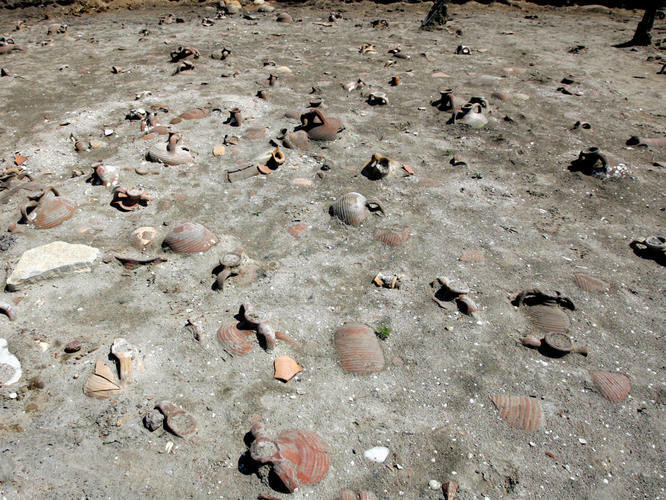 But local frustrations were soon overwhelmed by the sheer magnitude of what was being so carefully lifted from the mud along the Sea of Marmara: millions of pottery shards, bones from 60 different animal species, and many other remnants of the booming trade that took place in the Middle Ages. Back then, Yenikapi, the dog-eared Istanbul neighborhood where the artifacts were uncovered, was the glorious port of Theodosious. It was here that the world's rarities arrived at Constantinople, the eastern flank of the Roman Empire. For archaeologist Ufuk Kocabas from Istanbul University, it's the find of a lifetime. "Up to now, we found 36 shipwrecks. This is the world's biggest shipwreck collection ever found," he says, adding that the condition of the artifacts is "wonderful." 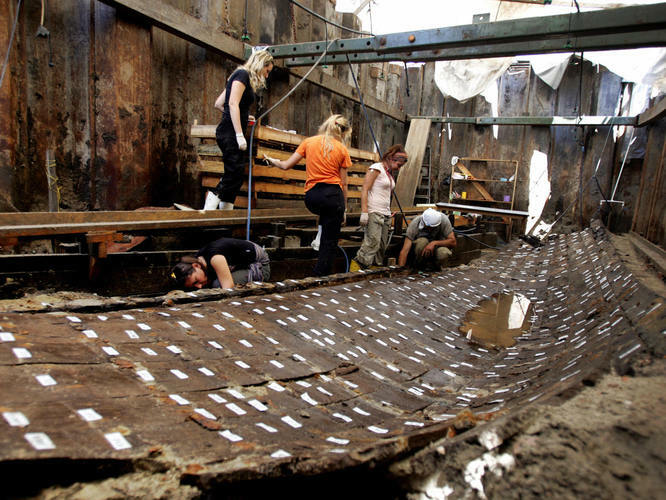 Against a backdrop of transit projects under way after years of delay, timbers from the Byzantine vessels now rest in huge tanks where freshwater is slowly circulating, leaching the salt from the ancient wood. It's a process that will take years, during which time Kocabas says the wood must be protected from new enemies such as bacteria and mosquito larvae. They'll use biocides and goldfish for that. "[Goldfish] like to eat this larva," he says with a laugh. The Istanbul Archaeological Museum is in charge of the project overall, with Kocabas and his colleagues taking care of the ships. They range from small cargo boats to mighty Byzantine naval vessels that helped break two Arab sieges, and repelled other would-be conquerors. The Byzantine navy was extremely powerful at the time, Kocabas says, because of a terrifying secret weapon that spit flames known as "Greek fire" — the ancient equivalent of napalm — that burned even in water. It will take years to preserve and reconstruct the Byzantine fleet, and a new museum will be needed to display the vast trove of medieval finds. By that time, Istanbul commuters may be humming along under the new Bosphorus tunnel, or clinging to straps on a new subway line. But archaeologists will be watching this government's other projects, such as the new excavation under central Taksim Square, to see what wonders may await in this history-soaked corner of the world.